The Messie Kitchen: Polly Motzko’ Farfalle Bolognese with Zucchini and Fresh Basil for Garnishing. 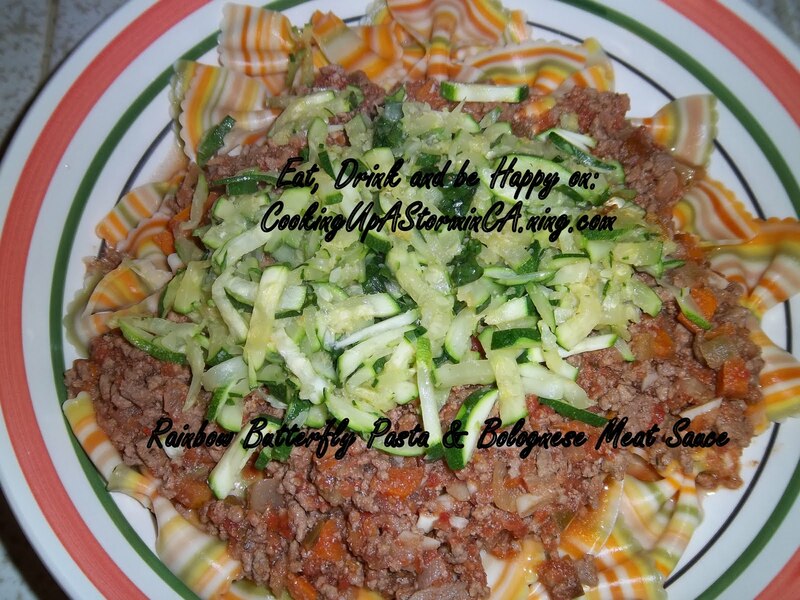 Polly Motzko’ Farfalle Bolognese with Zucchini and Fresh Basil for Garnishing. Hi everyone! Thanks for all the well wishes you've been sending my way! I'm feeling much better with every passing day, so whatever you're sending, keep it up! Today, I have another guest post, from Polly Motzko, the creator of Cooking Up a Storm All Over the World, a foodie website dedicated to her recipes and traditions. Polly contacted me about my request for guest posts, and sent a yummy looking dish my way. So without further ado, here comes Polly! I was going through my many bookshelves of cooking books and ran across this wonderful new edition of Marcella Hazan’s that is a combination of her first book and the second and then 50 more wonderful recipes. This printing is dated November 5th, 1992. (My parent’s anniversary is on that day, only quite a few years before in 1949. So, when I make this dish for them it will be special because the book was printed on the day when my mother Ramona Hart and dad, Ernest Le Pore-became an item! Rather than watching this on the stove for hour on end, I have streamlined it for modern day busy people like me, who want to make something wonderful up in advance and have it on hand to use in countless wonderful recipes. I am not sure if Marcella Hazan realized how the crock pot could come in handy for slowly simmering this sauce and in braising more economical cuts of meat; I don’t think she would object to my adaption here. I was raised in a house where a marinara didn’t “taste right” without it in it…so this version reflects my personal tastes, and since I am going to make this for me and my “family” then this version it is. I am going to use a huge, multicolored Farfalle pasta that I got from The World Market. It is the most vivid multicolor pasta I have ever seen in my life. I also added a sauté of chopped zucchini and yellow squash to the top of it, because I love zucchini and I am opting for more fresh veggies in my diet, plus I think it goes nicely with the colors in the pasta I chose. Ragu, as the Bolognese call their celebrated meat sauce, is characterized by mellow, gentle comfortable flavor that any cook can achieve by being careful about a few basic points. • The meat should not be too lean a cut to extract its juices for the subsequent benefit of the sauce. • Add salt immediately when sautéing the meat to extract its juices for the subsequent benefit of the sauce. • Cook the milk in milk before adding wine and tomatoes to protect it from the acidic bite of the latter. • Do not use a demiglace or other concentrates that tip the balance of flavors toward harshness. • Use a pot that retains heat. Earthenware is preferred in Bologna and by most cooks in Emilia-Romagna, but enameled cast-iron pans or a pot whose heavy bottom is composed of layers of steel alloy is fully satisfactory. 2 tablespoons butter plus 1 tablespoon to toss pasta with. 1 cup dry white wine-pick your choice here. 4-1/2 cups canned Italian plum tomatoes, with juice. I increased this substantially because I made almost exactly to the recipe and the dish didn’t look or taste right-to me. (Everyone is different of course, which is what makes the world great. In my world I added garlic, increased the tomatoes to more of a “meaty marinara”, cut the butter back and that is about it. The rest of the dish is my invention entirely. 1-1/4 to 1-1/2 cups or more of pasta-I used jumbo multicolored Farfalle here. 1. Marcella Hazan’s choice of pasta is tagliatelle or tortellini and green lasagna goes really well with this sauce. 2. Put oil, butter chopped onion in a pot and heat to medium. Cook and stir until translucent then add celery and carrots and cook for 2 minutes, stirring to coat well. 3. Add ground beef, large pinch of salt, and a few grindings of black pepper. Crumble meat with fork, stir well and cook until beef is not raw and no longer pink inside. 4. Add milk and let simmer gently stirring frequently, until milk has bubbled away completely. 5. Add the wine and let it simmer until it has evaporated, then add the tomatoes and stir to coat all ingredients well. When the tomatoes begin to bubble, turn heat down. Simmer sauce at the laziest boil. PUT IN A CROCK POT ON 250 DEGREES FOR 3 HOURS OR UP UNTIL 6 HOURS, STIRRING AFTER 2 HOURS. To keep it from sticking, continue the cooking, adding ½ cup of water whenever needed. In the end, however, no water at all must be left and the fat must separate from the sauce. Taste and correct for salt if needed. Toss with cooked, drained pasta, adding the tablespoon butter and some of the freshly grated Parmesan on the side. Make pasta sauce at least 3 to 6 hours ahead of time and arrange making the pasta after the sauce is through simmering for its total time-3 hours is recommended. Take 2 finely chopped zucchinis and about 1/4 to 1/2 cup of fresh basil, along with 1 or 2 garlic cloves, minced. Sauté in a little olive oil and a little more minced garlic, if you like. Sauté until the squash is nicely tender. Add enough fresh basil cut in a chiffonade style to the vegetable mixture and top the cooked pasta on the sauce with this. This doesn’t take long because you don’t want to cook the zucchini til their mush, just a little tender. It is really great! 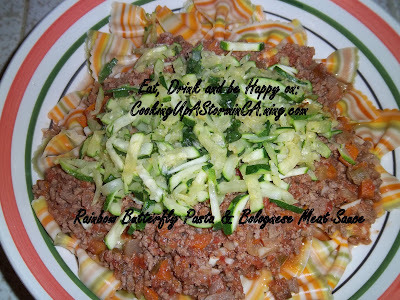 If you spoon some of the Bolognese sauce on the pasta, the vegetables give it a nice texture and flavor. Top the zucchini/squash/garlic mixture on top of the pasta of your choice. Grate some fresh Parmesan and put on top to crown the dish…and lastly ENJOY! The Parmesan gives the dish the extra SALTY flavor that it needs, so don’t make the dish without it…or substitute something very similar like Romano. Polly Motzko will include them in her upcoming cookbook, with your permission, that is. Yours truly in food and all that is wonderful on your plate! Bowties are the best pasta. Hope your leg feels better! This looks great. I love the fact that it uses the crock pot. For days when we're rushed, it's nice to fall back on that and still get out a great meal. Crock pots are great for these warm weather days too. I love being able to turn it on and not worry about my entire house heating up. I'm hoping tomorrow is another day of increased recovery! Great looking recipe, and I love the colors, this will be worth a try on pasta night, I think it will be a real crowd pleaser. This looks great! AND...that pasta looks amazing!!! This looks delicious! I love the colorful pasta...I don't think I've ever seen pasta so vibrant before! I agree--that pasta is beautiful--the recipe is enticing! I like the modern use of the crock pot as well! Looks great. I've never seen multicolored pasta like that. Hello there everybody on the site here who made wonderful comments about my original tricolor pasta dish with a healthier version of my friend Marcella Hazan's Bolognese sauce. If you join CookingUpaStorminCA.ning.com you can meet cooking friends, hearly 150 now, upload your photos in the Culinary Slide Show, Videos That Teach & More, No Fat Lots of Flavor, Diabetic Recipes and much more!